The Cardinals rally at Busch Stadium yesterday was great. The day was warm and sunny with a temperature of 72 degrees...much warmer and drier than during the World Series. We arrived around noon and downtown St. Louis was already a sea of red. They opened the gates at 1:00pm and we bought lunch and then found our seats. My sister, brother-in-law, nephew and nieces were there and they sat with us for a while. The parade began at 2:00pm and we were able to watch it on the big screen in right field. At about 3:15, the Anheuser-Busch Clydesdales entered the stadium to kick-off the ceremony. The World Series trophy was in the wagon along with Cardinal announcer and former Cardinal player, Mike Shannon. 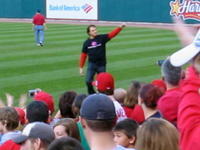 Tony LaRussa and the players then walked out from the dugout to the stage that was set up behind the pitchers mound. The rally lasted about an hour or so and ended with fireworks. The Cardinals played their hearts out this year and are so deserving of the title of World Champs. This celebration was 24 years in the making and definitely worth the wait. I can't wait until next season! Maybe we can do it all over again!! Tickets, tickets, we have tickets!!! 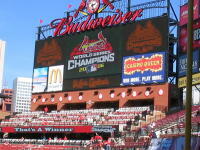 I can't believe we were able to get tickets to the celebration at Busch Statdium. It's going to be so much fun! 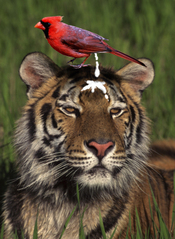 Cardinal Fever is still running rampant through the St. Louis area. Bill & I went to Macy's this morning to buy World Series shirts. Quite a few other people had the same idea. 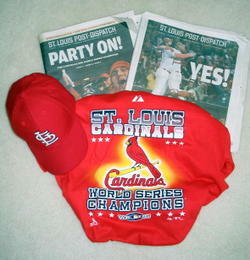 We also bought both editions of the St. Louis Post-Dispatch to keep as a souvenir. The celebratory parade is scheduled for tomorrow at 2:00pm. It starts at Market & 18th and ends at Busch Stadium. You can only enter Busch Stadium if you have a ticket. Tickets will be available today on-line at 4:00pm and I'm hoping that we'll be fortunate enough to get a pair. Keep your fingers crossed! Jack Buck would be proud. Here's to you, Jack! Game 4 of the World Series was rained out tonight. The game was supposed to start at 7:20pm but the officals didn't call it until a little after 9:00pm. I can imagine that the fans were quite cold and wet by the time they finally left Busch Stadium. Anyway, Friday was supposed to be a travel day but now they'll play Friday and then fly right to Detroit if games 6 and 7 are necessary (which we are hoping will not be the case). A friend of mine e-mailed this picture to me. Even though I am a cat lover, I still think it's pretty hilarious. I'm sure Tiger fans wouldn't agree. It pretty much sums up the feeling here in St. Louis though...hee hee hee. 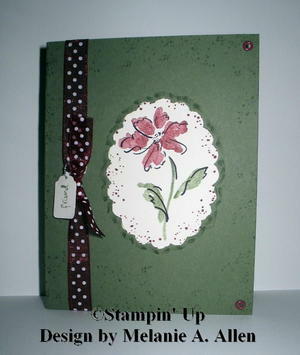 The flower is from the Heartfelt Thanks stamp sets which is one of my favorites. I used the Marvy Giga Scallop Punch to cut out the focal image. I added some splatters using one of the Itty Bitty Background stamps and then added eyelets and the ribbon. I used one of my small tag punches to make the "friend" tag and secured it to the ribbon with silver cord. I then decided that something was missing so I added ink to a pencil eraser and stamped around the focal image. It draws a little more attention to the flower. I watched Casper's Scare School...well, actually I only watched the scenes in which Toni & Daryl appeared. In case you missed it, here's what they look like as animated characters. The Captain's hat cracks me up! Cardinals won 7 to 2 last night. Here's hoping for another win tonight! I check out the beer aisle on almost every trip to Dierberg's. I'm always looking for new brews, especially American microbrews. Imagine my surprise when I spotted a new ale today. I had to do a double-take as I could not believe what I was seeing. Tiger Beer...no way! What Einstein thought that it would be appropriate to stock a brew called Tiger Beer when the Cardinals are playing the Tigers. Anyway, I left the Tiger Beer on the shelf and grabbed a six-pack of Pete's Rally Cap Ale instead. I've always loved Casper the Friendly Ghost and watched it quite often when I was a kid. There is a new direct to DVD Casper movie which premieres on the Cartoon Network tomorrow night at 6:00pm Central time called Casper's Scare School. OK, so there's really another reason I am planning to watch this other than to relive childhood memories...Captain & Tennille are two of the voices and they perform two of the songs in the movie! How cool is that? 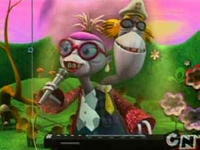 They are the voices for a two headed character named Ankle (Aunt Belle & Uncle Murray) and, according to Toni, Daryl's head wears a captain's hat. Too funny! I watched Chris Cognac (aka The Hungry Detective) on Tuesday and, believe it or not, he visited a microbrewery! I honestly didn't know that when I posted my comment on Tuesday. Anyway, he was in one of my favorite cities, Las Vegas. I would have preferred that he had visited the Monte Carlo Pub & Brewery but he stayed away from The Strip. It will be interesting to see how the show progresses and how many cities he visits. Hey Chris, if you need some suggestions for great restaurants in St. Louis, let me know.